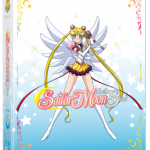 Following last week’s news about Sailor Moon Sailor Stars Part 1 coming to DVD and Blu-Ray on June 18th fans can now pre-order the set from Amazon. 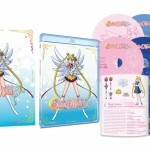 This includes the less expensive DVD version, selling for just $28.26, as well as the standard Blu-Ray version, which is selling for $61.12 and the Limited Edition Blu-Ray which is $71.73. This is slightly less expensive than pre-ordering from RightStuf, which currently costs $71.99, though users ordering from RightStuf will be able to get the exclusive coin. If you pre-order from Amazon using the links below, or any other Amazon links such as the ones on the left sidebar on the main page, this will support this site. This set includes episodes 167 to 183. 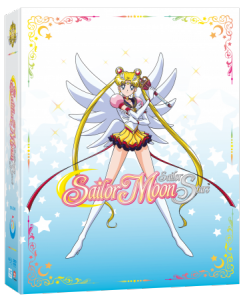 This includes the short six episode Nehelenia arc, which is a sort of bridge between the SuperS season and Sailor Stars, and the introduction of the Sailor Starlights and their alternate identities, the Three Lights! The set will end with the introduction of the mysterious Chibi Chibi! These will be available for the first time with English audio, featuring Viz’s new English dub of the series, as well as Japanese audio with English subtitles. 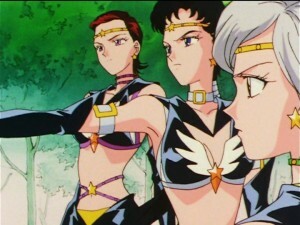 We never got a straight answer as to why Sailor Stars wasn’t originally dubbed but some fans believe that it was because the content would have been considered inappropriate for some viewers. If that was ever true it seems like this is no longer the case! Do you ship Seiya and Usagi? Will you be getting this release? I’m certainly looking forward to watching it in English for the first time. Though I’ve imported the Japanese DVDs and laserdiscs of Sailor Stars over the years the copies I’ve watched the most were VHS fan subs and a bootleg DVD, both of which used the VKLL subtitle scripts. This entry was posted in Merchandise, Sailor Moon Anime (1992) and tagged Blu-Ray, Chibi Chibi, DVD, Sailor Moon Sailor Stars, Sailor Starlights, The Three Lights, Viz English Dub by Adam. Bookmark the permalink. Anyways, I digress, I’m really happy to see it available for preorder, but I think I will wait for the inevitable price plunge before getting this one. 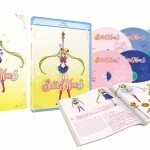 16 episodes for $70+ is a bit steep. I know I’ll be asking my library to place an order for it later today. Nice. But isn’t that the English version or Japanese version? I already preordered it a few days ago when it first popped up on Amazon (I was checking back multiple times a day until it was finally there). I like Seiya as a character, but I do not ship Seiya with Usagi; Usagi is just meant to be with Mamoru (that’s kind of why they were reincarnated together). I feel like it’s mentioned somewhere that Kakyuu’s lover was killed by Galaxia… but maybe that was in the manga (I can’t remember). I think that is in the manga, I also don’t know if any sort of romance is even mentioned between Kakyuu and Seiya in the manga. In the anime, it could be implied, though it’s also just as likely it’s not a real thing. (When Seiya thinks of Kakyuu, the image changes to Usagi.) This could be that Seiya just feels like Usagi is taking the place of Kakyuu in her heart (not romantically but as a loyalty thing) and it’s troubling her. Or it could imply she had a crush on or a relationship with Kakyuu but she is now beginning to have those feelings for Usagi. Either way, no wonder Taiki and Yaten get so upset with Seiya. Today is Sailor Mars’ birthday. With a day late, happy birthday to our purple-haired, scarlet-clad astral Khaleesi; notre dame des flammes, Sailor Mars! Tell Aurélia that Sailor Mars has black hair, not purple. Naoko Takeshi often drew her with both black and purple hair, alternatively. Also, Toei gave her black hair in the 90’s anime, while her hair color is between purple and black in Crystal. And it’s the same for Sailor Saturn. That’s why, to me, though I prefer Sailor Mars with black hair, I keep on imagining her with purple hair, only to make a difference with Saturn’s black hair. At least, I think that Mars’ hair color is a lighter shade than Saturn’s hair. But you are free not to agree with me. Well, her hair is supposed to be black, that’s true. But they definitely color it purple. But the ribbon is also colored as purple in the anime and in the manga. Indeed! Both Luke and you are right. And the truth is, I would have found great if Naoko Takeuchi had kept this black bow on Sailor Mars’ outfit, because red and black really fit together. Also, since Sailor Saturn’s outfit colors are purple and a shade of dark red, and since she also has black hair, it turns out that her and Sailor Mars almost have the same color palette, which is a bit annoying. This is why I like thinking that Mars has purple hair, only in order to make some kind of a chromatic difference between her and Saturn. 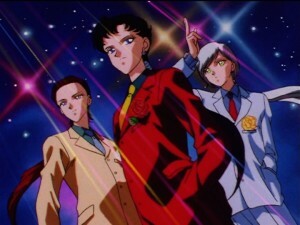 The starlights were men that transformed into women in the original anime, that wasn’t a dub thing. They were always women only in the manga (women taking fake male identities, but still women). True that, Nina. 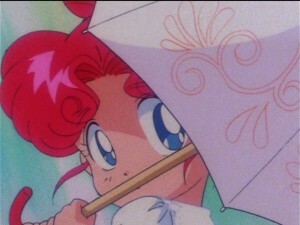 Although the Japanese version did use female voice actors for both forms. 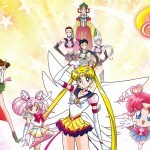 I adore Seiya and Usagi. No one can deny, there was definitely chemistry there. I just really hope Seiya’s voice is good, or I’ll be so disappointed. Just preordered mine! Very anxious to see the Queen Nehellenia arc! It’s definitely a series high point! I really wanted to buy the VIz set back in the day. I have the Italian set, but I wanted it on language I somewhat speak. The video quality turned out to be so bad that I cannot believe they sell it as official product. Try the ADV sets! Worst looking DVDs in my collection! But they were not advertized as “The best possible quality, pure magic and our pride and joy remaster, right? No and at the time our standards were lower but even then it was pretty dissapointed. Speaking of the ADV sets, they are the most confusing releases for me. I remember there is one episode where the audio switches to the Dic audio for a few moments. I was stunned and pretty mad, back then. Also, the fact that they were sold and advertised as “complete” but were still missing episode 67. Also, they used artwork from the S or SuperS season on the boxes…such a mess! The quality was atrocious, they were overpriced, but I still have them after all these years.